Emerging and reemerging infectious diseases are some of the most important diseases that must be controled in the 21st century. Many pathogenic microorganisms have sugar chains on their surfaces. Some viruses also carry sugar chains which play a role in their escape from the host’s immune systems and in their active transmission into the host. The mutual recognition systems via sugar chains between microbes and their host may be deeply involved in the evolution of both microbes and their host animals. For this reason, the study of sugar chains should be promoted to control infectious diseases. This paper describes the importance of viral glycobiology and states the necessity to develop and foster a new research field, “glycovirology”, incorporating recent studies by the author’s research group and others. Six countries including Japan, the U.K., and U.S. announced the successful completion of the Human Genome Project on April 14, 2003. Since then, life science has undoubtedly entered a new stage. Genes in the genome produce proteins to maintain life activities. However, half or more of the proteins in animal cells have sugar chains. After translation, proteins undergo various modifications such as glycosylation, phosphorylation, methylation, sulfation, and glycation. Among these, glycosylation has been the most widely studied in recent years. After proteins and lipids have glycosylated, they can express new functions and properties. In other words, the properties and functions of proteins and lipids largely depend on glycosylation. Glycosylation gives a 3-dimensionally stable structure to the protein, providing protection from proteases. Viruses evade the host’s immune defense systems by adding sugar chains to their spike proteins and in some cases gain easy entry into host cells by being trapped by lectins that recognize host cell sugar chains. Furthermore, it has been shown that sugar chains themselves are important as determinants of blood types and have cell adhesion activity. Glycosylation of proteins and lipids is also performed by glycosyltransferases. According to Encyclopedia of Virology (eds. R.G. Webster, A. Granoff, Academic Press, 1994), viruses isolated from animals number about 570 type species, 40% of them containing an envelop derived from host cell membranes. This envelope consists of host-derived phospho- and glycolipids, complex lipids including cholesterol, and virus-specific glycoprotein spikes inserted into the viral envelope. These spikes play essential roles in viral adhesion to the host and viral release from the host after budding. Glycosylation of the spikes is also essential for maintenance of the 3-dimentsonal structure of the viral spikes and the expression of their function. Sugar chains on the host cell membranes are very diverse and have extremely high species specificity. As all viruses grow only in their specific host cells, they always have a host (cell) range, referred to as host specificity. Studies of the expression mechanisms of the host range specificity of viruses frequently show that the viral expression reflects the specificity and diversity of the sugar chains on the host cell membranes. We have shown that many enveloped viruses recognize and bind to sugar chains on the host cell membrane, acting as specific viral receptors 1-6. We also found that mutations in the receptor-binding pockets of spike proteins involved in binding to the receptor sugar chains are less frequent even in viruses (e.g., influenza viruses) where mutations very easily occur in antigenic sites 7. These findings suggest that sugar analogs or receptor sugar analogs which block the binding of the receptor sugar chains of the host cells membrane could potentially become the seeds of innovative antiviral drugs able to overcome viral mutations. 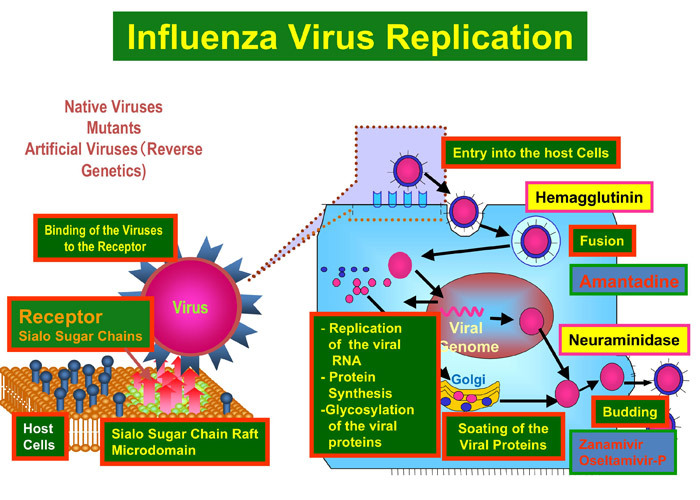 The role of sugar chains in various viral infections is very important and diverse, and the development of antiviral drugs targeting sugar chains is considered to have great potential. The process from the transmission of viruses with glycoprotein spikes into host cells to the release of progeny viruses consists of various steps including attachment of the virus to the host receptor, penetration, uncoating, viral protein synthesis, glycosylation, transport by intracellular trafficking, packaging, budding, and release of progeny viruses. Viral protein sugar chains are structurally and functionally involved in almost all these steps. However, many of their molecular mechanisms are unknown. If the role of sugar chains in each step (Fig.1) is clarified, sugar chain-related compounds and glycosyltransferase inhibitors that specifically block these steps could be developed, ultimately leading to the development of innovative antiviral drugs with wider point of view. Host cell sugar chains are very diverse but the expression of each sugar chain in species, tissue, and individual cells is highly specific. In other words, natural sugar chains have very diverse structures but their expression is highly localized and specific. On the other hand, viruses have a defined host range specificity and recognize target host cells and receptor molecules on the host cell surface are highly specific. This fact suggests that viruses may have been taking advantage of the diversity of host sugar chains to expand the host range during evolution and the high specificity of viruses for recognition of the target host cell receptor may reflect the highly specific expression of sugar chains by host cells. Thus, there may be a larger number of viruses targeting sugar chain receptors than expected and future studies may identify more such virus types. Receptor sugar chains analogs and their chemically synthesized derivatives are likely to be developed as highly specific antiviral drugs because many of them strongly inhibit viral infection of hosts 8-12. It has been reported that modification of sugar chains on the viral spike protein is not only closely related to viral infectivity but also to the pathogenesis of viral diseases 13-15. In addition, glycosyltransferases expressed in host cells are involved in viral replication in the cells infected by viruses, suggesting the possibility of treatment of viral infection by controlling the expression of host glycosyltransferases 16. There is no doubt that post-genomic drug discovery is a very promising area in pharmaceutical development after the completion of human genome deciphering. Among post-genome products, proteins are the second most important "biological chain of life" following nucleic acids, while sugar chains are the third most important. As described above, carbohydrate/sugar chains have been shown to have important and diverse functions as receptors for viruses, as essential components of viruses, or as signal messengers in virus-infected cells. Glycovirology is a research field covering both glycobiology and virology. The 1st International Meeting on Glycovirology was held in Sweden in June 2007. As a Japanese member of the organizing committee, the author participated in initiating this conference. The sugar chain will surely be a very important target for research and drug discovery in the 21st century because of its close relationship to viral infection. We hope to develop the field of glycovirology and foster and increase specialists in this research.